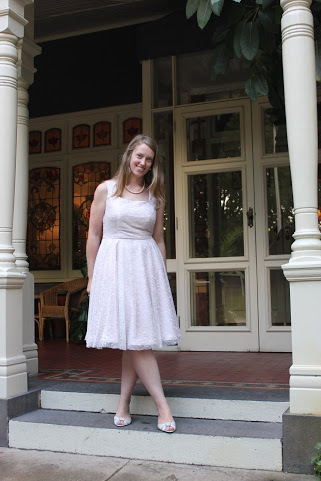 A whole month later, and I’ve finally finished writing my post on the construction of the SewCieTea dress (which is crazy, as that’s half the time it took to make it…..) Let’s jump right in shall we? Both the satin and the lace were from Rathdowne Remnants, and were quite affordable. 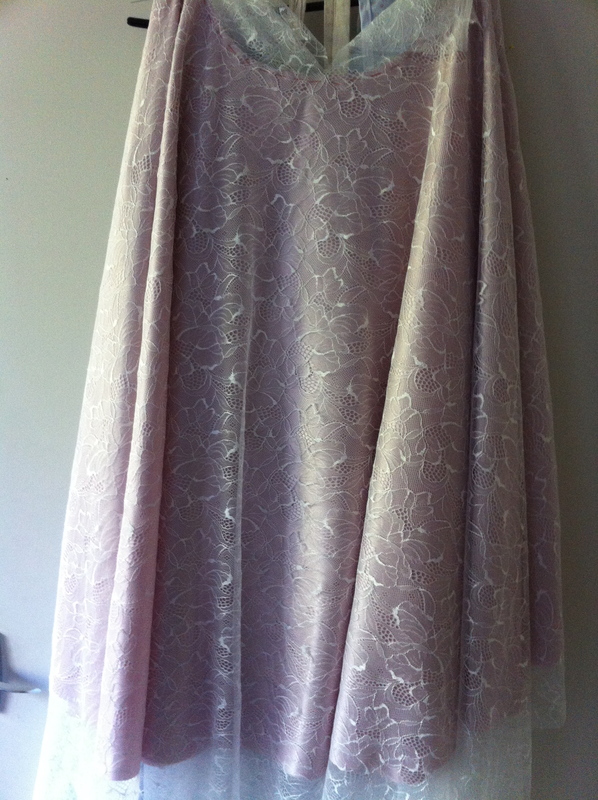 The satin was approximately $10 a metres, and the lace was $12 a metre. I would have liked some of the fancy very expensive lace, but at a fabric requirement for both of 4.5 metres that wasn’t going to happen. As the pattern was only 6 pieces, it was pretty simple to cut out, as long as you have lots of space. I cut the satin out at Social Sewing (large cutting tables) and used my rotary cutter which stopped the satin from slipping and distorting under the pattern. The key was to use a new sharp blade, and pattern weights if you have anything heavy on hand. The darts were marking using a serrated tracing wheel and carbon paper. The lace I didn’t cut out precisely, while on a large flat surface the lace was laid over the satin pieces to match the lace pattern and run the print straight down the bodice front. I pinned it extensively to the sating (literally pins every 2″ over the whole bodice, with the lace then just cut as a huge rough square over the top of the satin. Taking it home was a little tricky, as I had to lay something over the lace before rolling it up to take home, or else the pins were going to be a mess with all the lace getting tangles! As you can see above, the basting was quite detailed and was all over the bodice. It was probably a little excessive, and the basting was quite time consuming, which was then replaced with the white meandering stitches to hold the lace in place across the bodice. Each line of stitching takes it’s own path as it follows the lace detail on the front of the bodice. 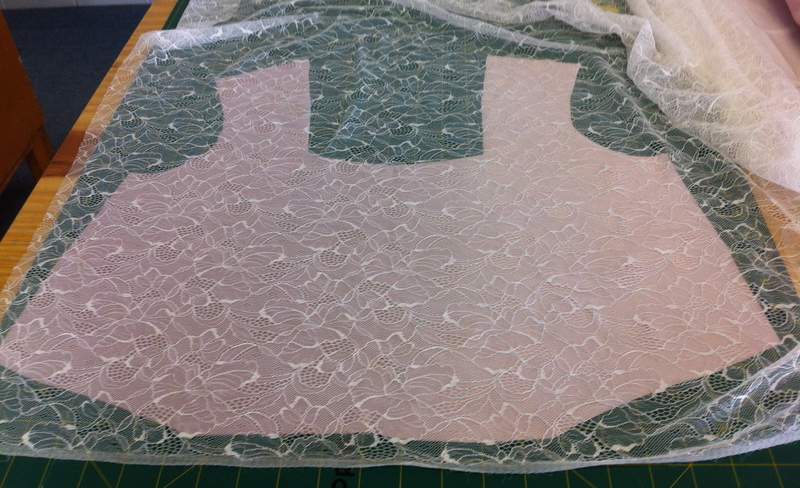 One the lace was sewn on the bodice securely, each dart was basted by hand then sewn by machine. Then the shoulder seams were basted and sewn. The satin was so slippery this method held it in place for machine sewing and stopped the lace or satin moving while stitching This fabric was going to be very unforgiving for unpicking, so it was well worth the time. 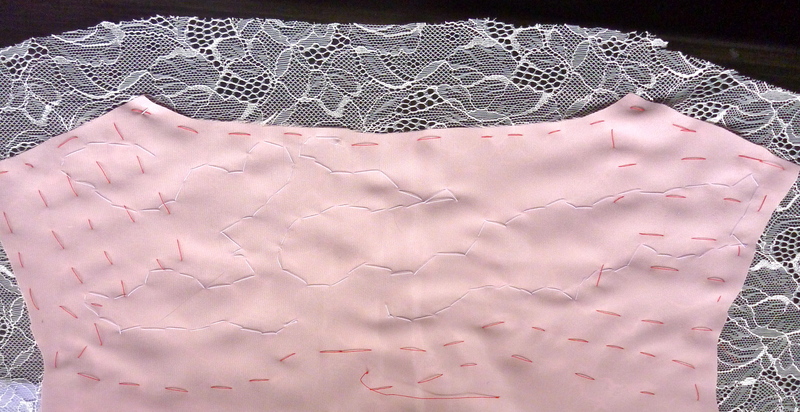 On short seams, it doesn’t take much more time than pinning extensively IMO. It wasn’t going to be practical (or humanely possible) to baste the lace to the satin on the skirt, so prior to attaching the skirt to the bodice, the lace was basted to the skirt pieces at the waist, and hung to let the lace and satin drop. That was the best suggestion made by Rachel, and what a fortuitous one, that stretch lace dropped by a comical amount. The moral of this story is, basting satin by hand does take more time…unless you have to unpick anything. Ignore that at your own unpicking peril. Don’t sew the lining to your dress while drinking. If you want a more detailed explanation of how NOT to make this crushing error, check this tutorial for three seam dresses, and this tutorial for two seam dresses. 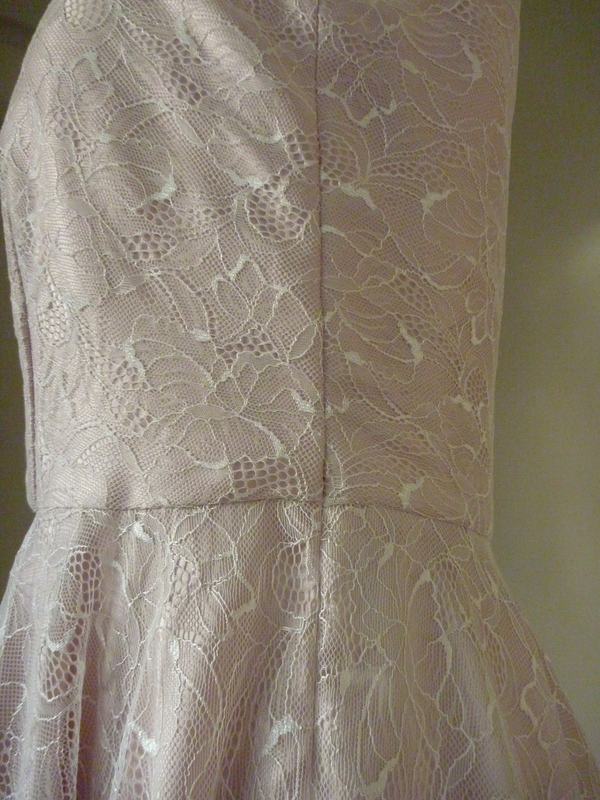 The only part of the dress that is lined is the bodice, which is sewn down at the waistband. 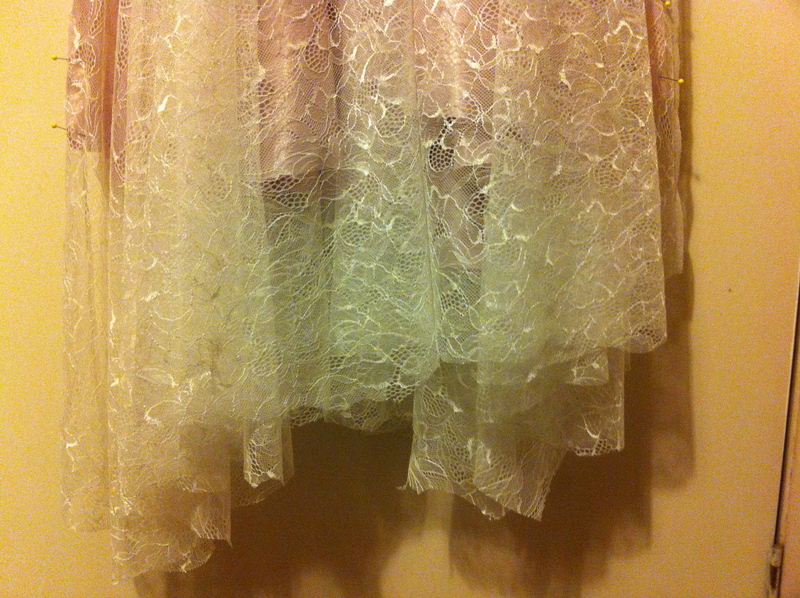 The skirt is unlined as it will mostly be worn with a crinoline. The pattern originally had facings, however to create a self-lining I cut out an extra bodice front and back. 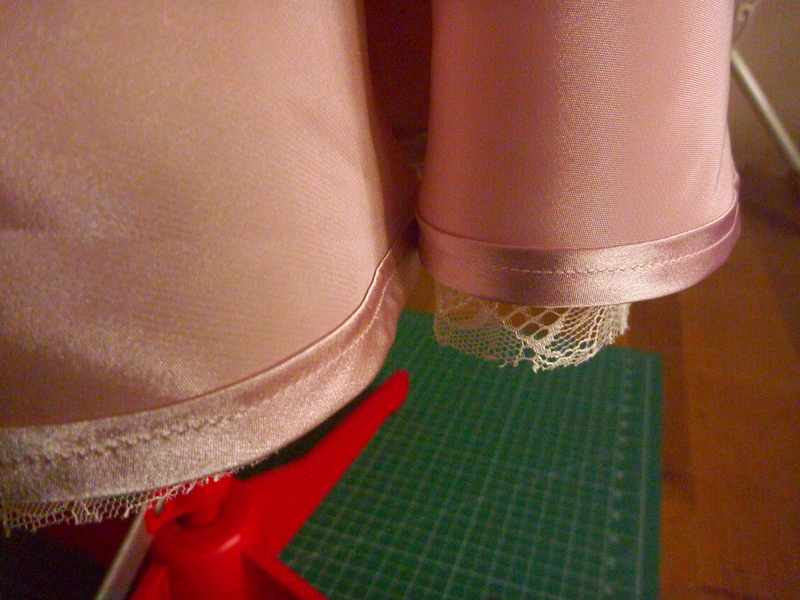 I didn’t sew the dart in the lining of the bodice front, instead opting for pleats where the darts should have been. 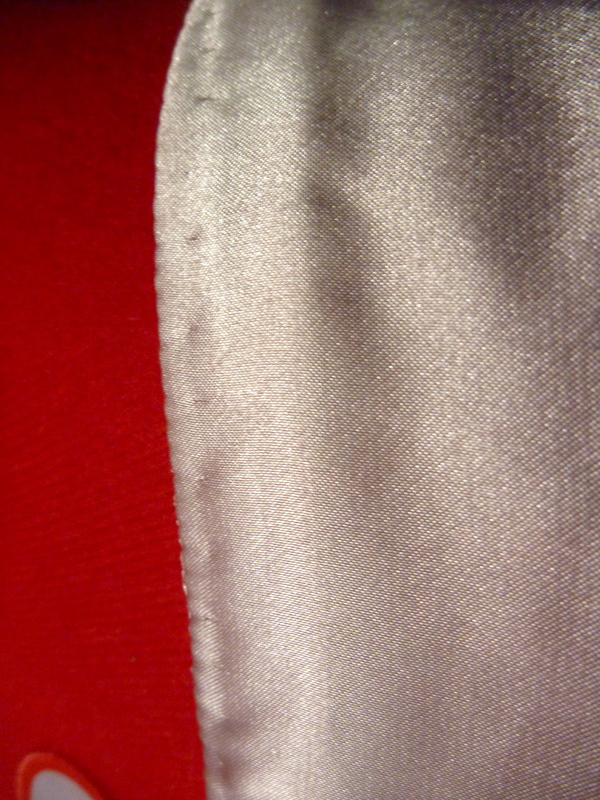 You can still see some of my red basting thread around the lining. The lining was handstitched down to the waistband to prevent it creeping up. I should have cut a slightly smaller lining to stop the lining from wanting to peek out at the neckline. 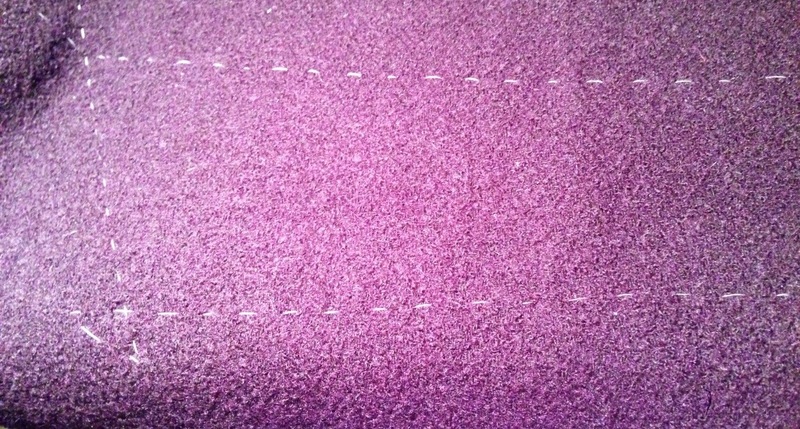 The prickstitching is a small detail that is an enjoyable part of the process…it’s a lovely sign you’re almost there. 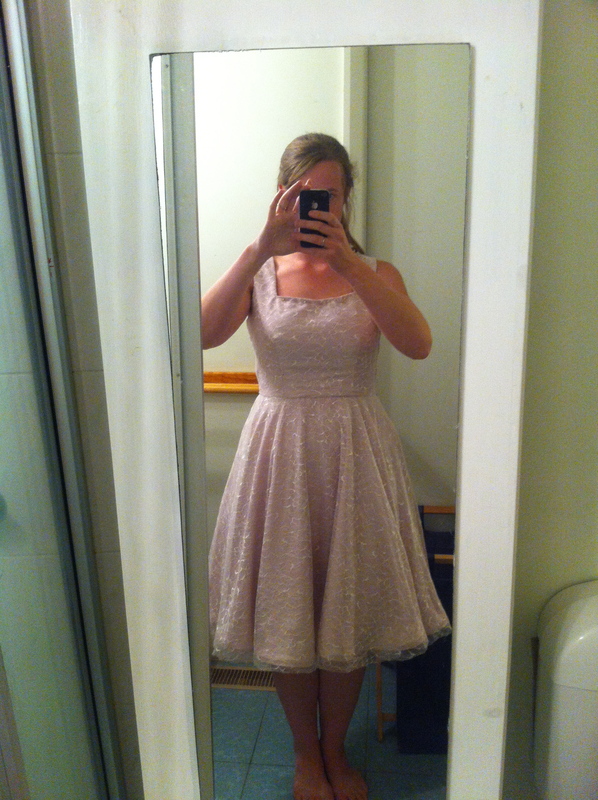 Oh, and here is a quick picture of the dress with a crinoline. 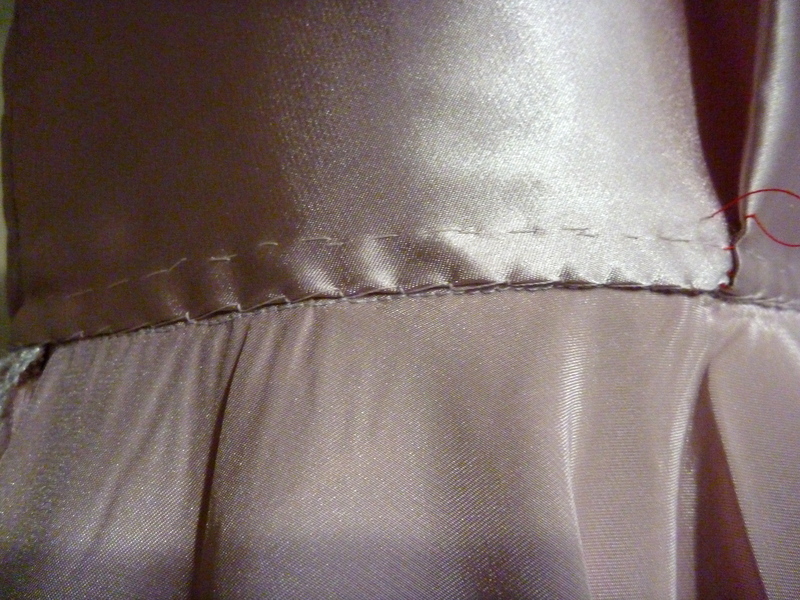 My initial preference for hemming the satin was to use this method by Poppykettle, and have a very neat tiny hem. The smaller the hem, the easier it is to get to sit flat as you don’t have to ease it in. As my local Clegs store was out of the belt backing material to do this technique, I was running out of time and options. On the Saturday morning, my mother kindly lent me her dress-form to hang the dress for hemming. The satin was marked to just above knee length, and marked with pins on the dress form. I opted to use Fusible iron-on tape to fold the hem, and then fold again then sew. While fast, the tape width was excessive and should have been halved to avoid having to ease in the hem. It should have yielded consistent results, but the easing was a great undoing that caused frantic unpicking on the Saturday afternoon. Hemming the lace was an epic challenge mentally. The original design of the dress had a lace edging underneath the hem of the lace overlay on the skirt, creating an artificial scalloped hem. Usually, with full circle skirts you need to let the dress hang for a few days prior to hemming as the bias threads can cause some interesting hem lengths. 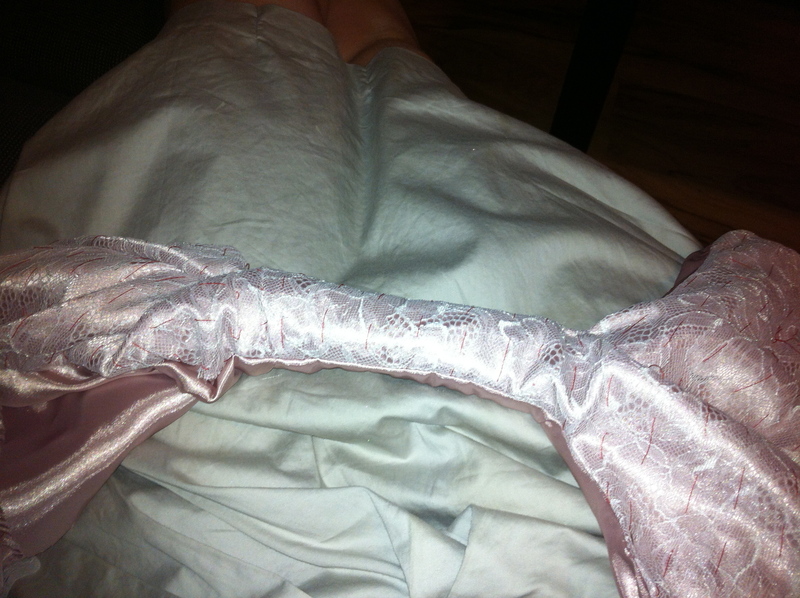 The satin I found didn’t drop too much, but the lace – oh my. The actual lace used on my dress was a stretch lace which dropped significantly, it did create an unexpectedly nice effect which I briefly considered keeping. The hem varied by nearly 10 inches. 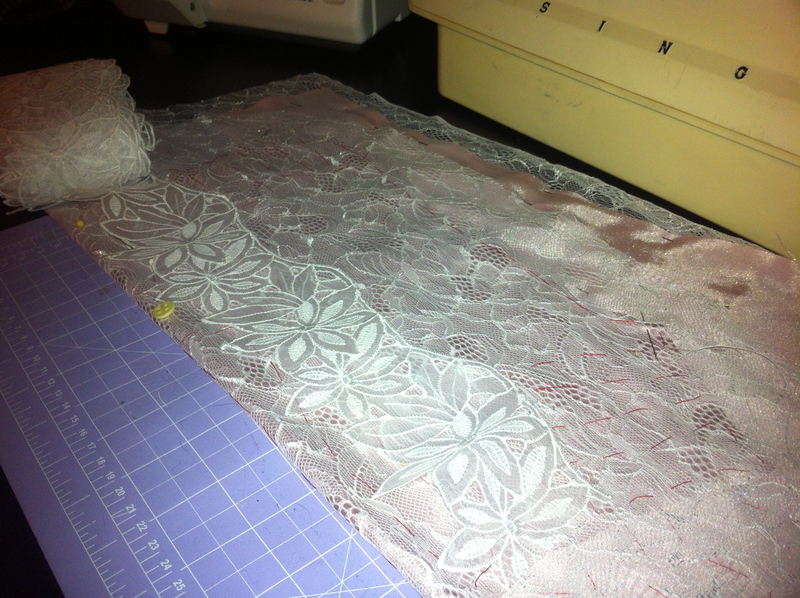 There was no way that it was going to be stable enough to hold 5 metres of lace border being sewn along the hemlines. Without the lace border to finish the lace overlay as planned, a final hemming option was really difficult, especially as I was trimming the excess lace an hour before SewCieTea was due to start! I considered using bias tape, satin ribbon, rolled hem, but each had its drawbacks, especially considering the gaps in the lace. In the end I trimmed it to 1.5″ below the satin. The lace doesn’t fray, and I honestly ran out of ideas. All and all, it was a slow process to make the dress, but it was really enjoyable. There seems to be a two speed sewing process for me, quick and practical (cake), and slow and very pleasing (frosting), does everyone have two speeds?